LOGISTAR (“Enhanced data management techniques for real time logistics planning and scheduling”) is a EU research project funded by the European Commission under the Horizon 2020 programme, which was launched in June 2018. It will last for three years, until June 2021. LOGISTAR is aimed at allowing effective planning and optimizing of transport operations in the supply chain by taking advantage of horizontal collaboration relying on the increasingly real-time data gathered from the interconnected environment. For this, a real-time decision-making tool and a real-time visualization tool of freight transport will be developed, with the purpose of delivering information and services to the various agents involved in the logistic supply chain, i.e. freight transport operators, their clients, industries and other stakeholders such as warehouse or infrastructure managers. To increase by 10% the load factors of freight vehicles derived from the optimization techniques applied to freight deliveries planning. To shorten by 10% the delivery routes thanks to applying planning of optimal routes relying on synchromodality, being continuously updated in case of disruption. 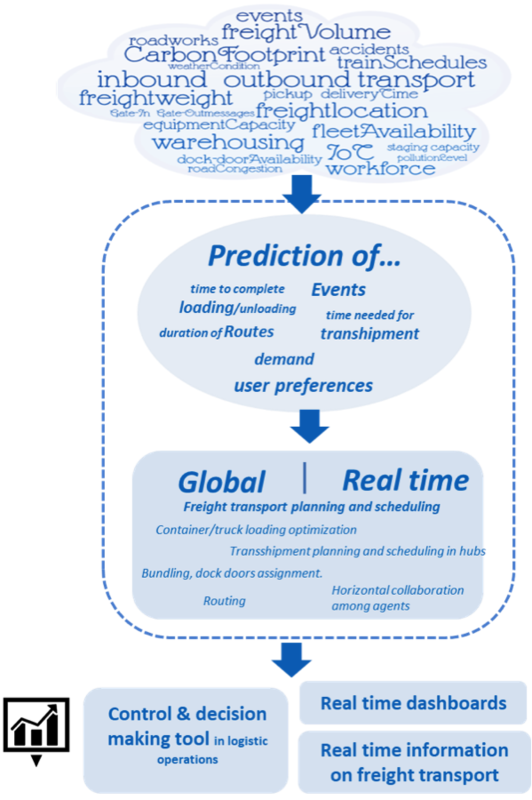 To increase the reliability and efficiency of logistics services by predicting events and incidents affecting the supply chain and by providing alternative routes in real-time to these disruptions. To facilitate the management of logistic operations by providing real-time supply chain visibility through dashboards not only displaying information but also showing deviations, alerts or recommendations to take actions. To boost horizontal collaboration among logistics agents focusing on full truck load (FTL) backhaul opportunities, consolidation of less than truckload (LTL) deliveries, supply chain collaboration and synchromodal opportunities. To increase the visibility of the delivery derived from the use of sensors to monitor the goods shipped and boosting to share logistic data and information among agents. To promote the sharing of open data in the logistics sector by promoting the benefits of collaboration and Big Data analytics across stakeholders. 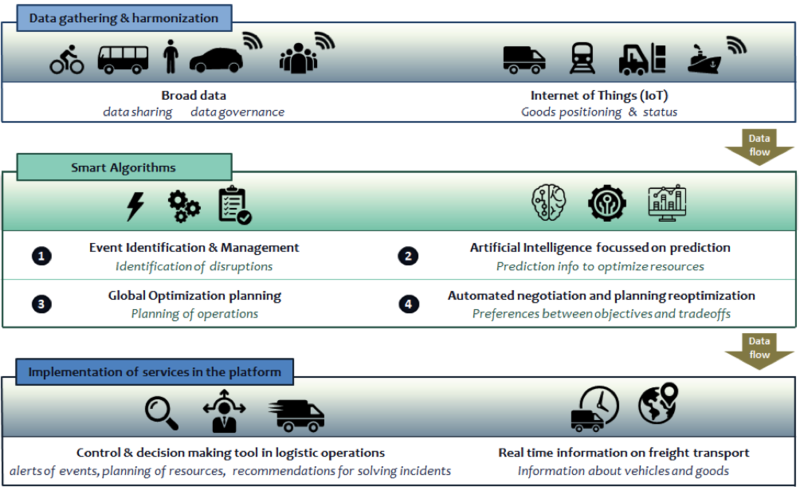 To enable new market opportunities on the logistic information services sector, by developing new business models focused on data and high value service delivery and exploring concepts such as “sharing” rather than “owning” transport assets. The policy and legal dimension will also be studied. The project will be tested in 3 uses cases with different stakeholders of the logistic value chain, such as 4/5PL –Logistic Service Provider, Infrastructure manager and FMCG -Fast Moving Consumer Goods- manufacturers).